suicide, and yet the dialog was witty, frank, and at times very funny. the lump in the throat that made me draw the comparison. they were meant to be one, just with a long, winding journey in between. and loves that kept me turning until they would meet again and again. experiences and the boots do exist and were her mother’s. I can’t recommend this book enough and it is deserving of more than 5 stars. 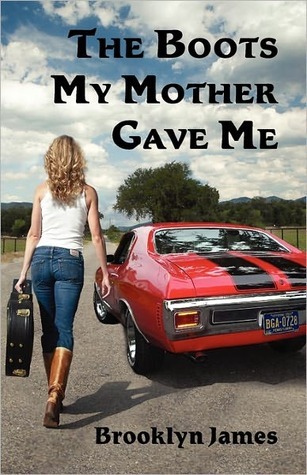 10 Comments on "The Boots My Mother Gave Me by Brooklyn James"
Thanks Elizabeth and Kathleen, ii hope you give this book a try, it was such a great experience for me. Fantastic review, Splage! I recently got my hands on this, with help from a friend, and I'm going to read it soon. Fabulous review, Splage! THE BOOTS MY MOTHER GAVE ME is one of my top five best reads this year so far! And surprise! I was lucky to find it offered as an Amazon free download. I'm hoping readers will see your review and give this captivating story a chance. It's really too good to miss out on!! Thanks oklanannie. I agree the book totally captivated me and hope there are a lot of readers out there that get to experience this story. Thanks Ladies, I can't wait to hear what you think! Great review, Splage. This book really does sound good. I just love this review and it makes me want to drop everything and read it right now!